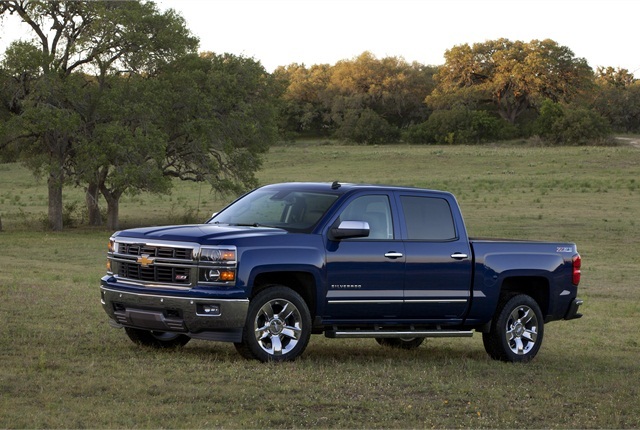 Photo of 2014 Chevrolet Silverado truck courtesy of General Motors. General Motors will initiate five new safety recalls covering about 2.7 million vehicles, the company announced May 15. The recalls cover passenger cars, including the Chevrolet Malibu, pickup trucks, and the Cadillac CTS. General Motors has informed the National Highway Traffic Safety Administration of the move, the company announced. "We have redoubled our efforts to expedite and resolve current reviews in process and also have identified and analyzed recent vehicle issues which require action," said Jeff Boyer, vice president of GM global vehicle safety. "These are examples of our focus to surface issues quickly and promptly take necessary actions in the best interest of our customers." 477 full-size trucks from the 2014 and 2015 model years for a tie-rod defect that can lead to a crash. The largest recall involves 2004-2012 Chevrolet Malibu, 2004-2007 Chevrolet Malibu Maxx, 2005-2010 Pontiac G6 and 2007-2010 Saturn Aura cars in the U.S. to modify the brake lamp wiring harness. These vehicles might have corrosion develop in the wiring harness for the body control module because of micro-vibration. This condition could result in the brake lamps failing to illuminate when the brakes are applied or the brake lamps illuminating when the brakes are not engaged. Additionally, cruise control, traction control, electronic stability control and panic braking assist operation could be disabled. GM said it is aware of several hundred complaints, 13 crashes and two injuries linked to the problem, but there have been no known fatalities resulting from the condition. The company issued a technical service bulletin in 2008 and conducted a safety campaign for a small population of 2005 model-year vehicles in January 2009. The second safety recall covers 111,889 Chevrolet Corvettes from the 2005-2007 model years for potential loss of low-beam headlamp operation. Models from 2008-2013 will be covered under a customer satisfaction program. All repairs will be at no cost to customers. When the engine is warm, the underhood electrical center housing could expand, causing the headlamp low-beam relay control circuit wire to bend slightly. After the wire is repeatedly bent, it can fracture and separate, GM said. When this occurs, the low-beam headlamps will not illuminate. As the housing cools and contracts, the low-beam headlamp function may return. This condition does not affect the high-beam headlamps, marker lamps, turn signals, daytime running lamps or fog lamps. Loss of low-beam headlamps could reduce the driver’s visibility, increasing the risk of a crash. GM said it is aware of several hundred complaints arising from the condition but no crashes, injuries or fatalities. The third recall covers 140,067 Chevrolet Malibus from the 2014 model year with 2.5L engines and stop/start technology. These vehicles are subject to the disabling of hydraulic brake boost that can require greater pedal efforts and extended stopping distances. Dealers will reprogram the electronic brake control module. The issue was discovered in testing of a future model with similar technology. GM said it is aware of four crashes, but it’s not clear that these are related to the condition. No known injuries are associated with these crashes. The fourth recall covers 19,225 Cadillac CTS vehicles from the 2013-2014 model years. The windshield wiper system may become inoperable after a vehicle jump start with the wipers active and restricted, such as by ice and snow. Potential lack of visibility could increase the risk of a crash. Dealers will replace the front wiper module, free of charge. GM said it is unaware of any crashes or injuries arising from the condition. The fifth recall involves certain 2014 Chevrolet Silverado and GMC Sierra light-duty pickups and 2015 model-year Chevrolet Tahoe SUVs. The tie rod threaded attachment to the steering gear rack in these vehicles may not be tightened to specification. With this condition, the tie rod can separate from the steering rack and a crash could occur without prior warning. Owners need to have their vehicle taken by flatbed to their dealer, where the inner tie rods will be inspected for correct torque, and, if necessary, the steering gear will be replaced, GM said. The automaker on May 14 began sending the repair procedure to dealers and started informing vehicle owners of the problem. The issue was discovered and corrected during assembly after the small number of vehicles was released. GM said it expects to take a charge of up to approximately $200 million in the second quarter, primarily for the cost of recall-related repairs announced in the quarter.